Considering Warner Bros. worldwide Harry Potter phenomenon is winding down, it’s certainly understandable that another studio—in this case 20th Century Fox—would want to clone it and come up with their own cash cow. 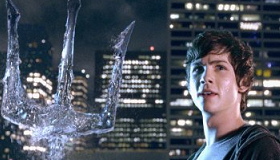 With two-time Harry Potter director Chris Columbus at the helm, Percy Jackson employs Greek mythology and every god it can muster in this frantic story of the clueless teenaged son of Poseidon who must do battle with a raft of evil forces convinced he’s stolen Zeus’ much-desired lightning bolt. Initial box office should be strong (likely from those waiting for the next Potter fix) and DVDs should fly off the shelves. Whether this becomes an ongoing franchise is harder to divine. Based on the series of books by Rick Riordan, Percy Jackson (Logan Lerman) has been aged up from 12 to 18, and the action, particularly in the second half, has been intensified—an initial encounter Jackson has with a high flying Fury is intense enough to send toddlers screaming towards the exit sign. Opening scenes showing Jackson’s ability to stay underwater in the pool for inhuman lengths of time should be a tipoff he’s no ordinary teen. Indeed, his mother (Catherine Keener) had a fling with Poseidon and now he’s become suspect number one in the theft of Zeus’ (Sean Bean) beloved lightning bolt. In no time Percy is whisked off to Camp Half-Blood (a thin stand-in for Hogwarts) where he learns the tricks of the gods even though at first it all appears Greek to this geek. Under the tutelage of the Centaur Chiron (Pierce Brosnan with animal magnetism) he is eventually teamed up with his best friend, Grover (Brandon T. Jackson), a satyr disguised as a high school student, and Athena’s daughter, Annabeth (Alexandra Daddario), a fiercely independent lass who can do battle with the best of the boys. If this trio sounds vaguely familiar (like Harry and his two buddies) you can file it under ripoff—but what isn’t in most of today’s movies? Anyway, they get a magic map and basically follow their own yellow brick road to a big showdown on top of the Empire State Building, which supposedly has some connection with Mt. Olympus. Along the way they face off with a Minotaur, Hades (Steve Coogan), a beastly multi-headed Hydra and, best of all, Medusa, played campily by Uma Thurman with a headdress of hissing snakes. Lerman, so effective in 3:10 To Yuma and as the young George Hamilton in My One And Only, here comes off as a Zac Efron wannabe but acquits himself nicely even when he’s forced to put on such lame props as “flying sneakers” (obviously Harry’s got a trademark on motorized brooms). Jackson and Daddario are fine and the adult actors all make the most of this silly stuff. Columbus knows his way around this kind of material even if some of the special effects look like they came from Deep Discount. The gods are well-rendered, but nothing special. Still for the Potter crowd, Percy provides a nice diversion until the real thing comes along. Rating: PG for action violence and peril, some scary images and suggestive material, and mild language.